Yesterday my 8-year-old made a very mature and kind decision to cut her hair and donate it to an organization called Children With Hair Loss. I am so proud of my Samantha and just love that she chose to do this all on her own. 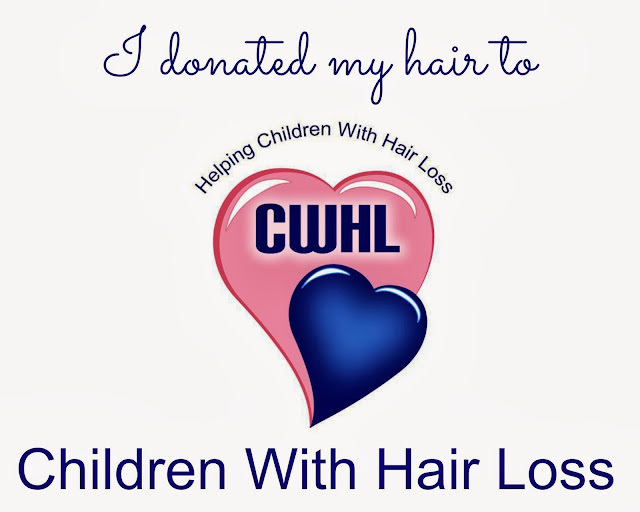 Today I'm sharing Samantha's new 'do and how you can donate your hair to Children With Hair Loss. 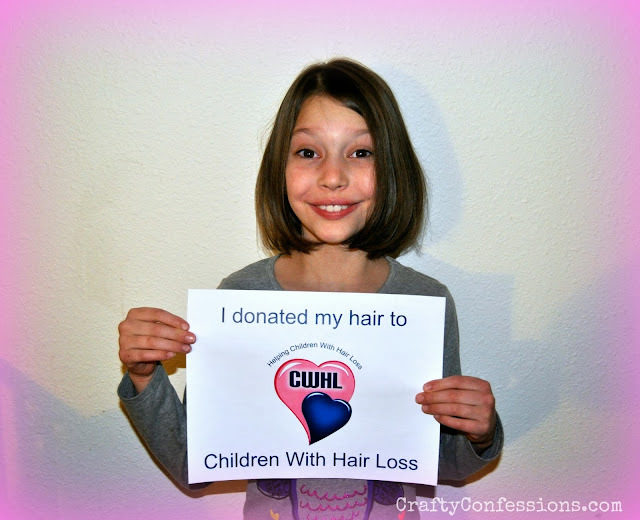 A few days ago I was looking online at Locks of Love to see if I could donate my hair. I have colored/bleached hair, so it is not an option for me right now. Samantha peeked over my shoulder and asked what I was looking at. I explained that there are children who have lost their hair due to cancer or other illnesses. 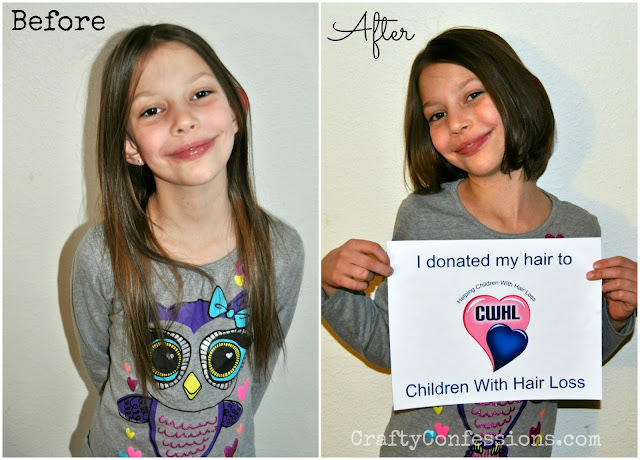 Some people choose to cut their hair and donate it so it can be made into wigs for those children. 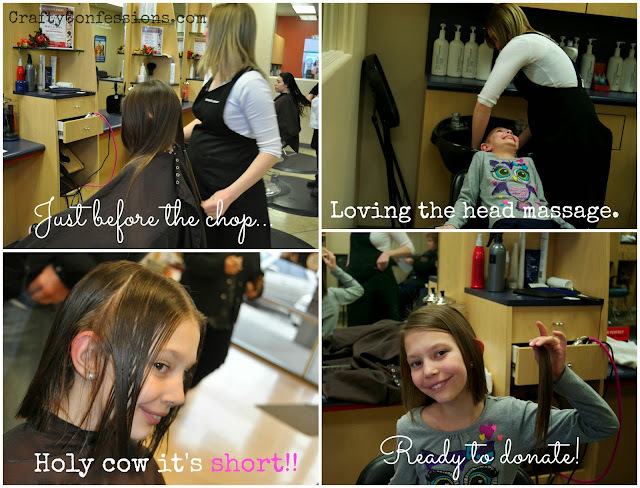 Without hesitation she declared, "I'm going to cut my hair and give it to those kids." I was taken aback at first because she adored her long hair and had vowed she would never cut it. I warned her that they would need to cut around 10 inches and that her hair would be short. My sweet little 8 year old replied with the most selfless answer: "I don't mind. I don't want bald kids to have cold heads." With that settled I researched how she could donate her hair. After reading an article by Forbes I decided that Locks of Love wasn't a good match for us, and found Children With Hair Loss. 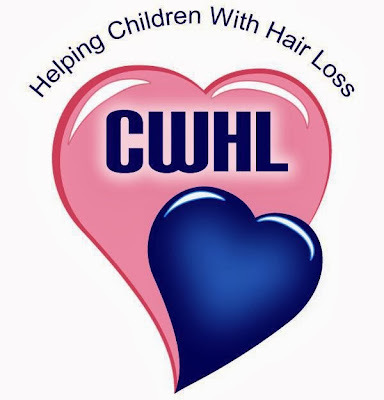 Children With Hair Loss is a nonprofit organization that provides a customized human hair replacement and care kit to over 300 children a year. They opened in 2000 and to this day have never charged a child for hair replacement. Now that we had a plan we took a few last long hair pictures and headed to the salon. This was only Sammy's second time getting her hair cut and she loved every minute of it. In the end she donated 10 inches in length. She loves her new hairdo and is so proud of herself. Mommy and Daddy and super proud of her too. Samantha is already planning to donate again once her hair grows back out. Hair must be at least 8 inches or longer, and in a clean, dry ponytail or braid. Print and fill out the donation form. Place the form and ziplock bag in an envelope and mail to Children With Hair Loss. For complete donation requirements, mailing address, and donation form go HERE. If you decide to donate feel free to print one of my signs and post your pics to my Facebook page. I would love to see them! In instances where a wristwatch might be constructed with s / s aluminium and / or fake rolex sale, ıt's going to weighing further, in relation to counterfeit looks after are prepared by using aluminium, which commonly light source through body fat. The value from looks after is now able to turn out to be judged by- typically the improving model manufacturers not to mention his or her's on-topic attraction with each of them typically the sexes. It again swiss replica watches some pave treasure dial with the help of 250 not to mention twelve over chop jewelry proceed 18k vivid white old watches. Ensure that through conscientious apprehensive audience that must be NOW, you could be with products have 100 % legal boundary and that also gigantic target you will have launched rooting isn't a hideout. Therefore through 20 59 90 years typically the son from entrepreneurs hublot replica not to mention Eugene Blum, Pierre-Alain Blum had become through essential an important part of Ebels forthcoming not to mention on going typically the Ebel norm from building wonderful looks after from time honored develop craftmanship. Pierre-Alain made it easier Ebel carry on within topsy turvy period of typically the latter 20 1960's not to mention 20 70s when ever having quartz fake rolex through follow activity had become a particular essentially instantaneous market place usual. - وضع جدول او خطة يومية و اسبوعية و شهرية و عليك بالالتزام به . - يجب ان تجعلى جميع الافراد ان يشاركوكى فى ذلك ، فكل فرد عليه ترتيب سريره و اغراضهالخاصة به و الاتزام بنظام نظافة المنزل . - عدم تناول الطعام الا فى المكان المخصص لدية و ذلك لتجنب الفوضى التى تتكون فى اقل من دقائق معدودة فمن الخطأ تناول الطعام فى غرف النوم مثلا . - اجعلى عائلتك على وعى بالنظافة و مشقاتها حتى لا يقوموا باهدار جهدك فهمثلا من يستخدم كوب او طبق عليه ان يقوم بغسيله و تنظيفه و وضعة مكانه و ذلك يجعلهم اكثر نظافة و يجعلك اكثر راحة . - عدم فتح النوافذ و الشبابيك لفترة كبيرة و ذلك لتجنب دخول الاتربة و التى تتراكم على قطع الاثاث و التحف و غيرها مما يجعلك تشعرين بالتعب و العناء اثناء تنظيف ذلك . - عدم ترك اى من ادوات الطعام او بقايا الطعام مكشوفة او معرضة للهواء لان ذلك قد يؤدى الى حدوث العفونة و صدور الروائح الكريهه . - المواظبة على القاء القمامة يوميا و عدم تركها فى الشقة حتى لا تصدر الروائح الكريهة او يتجمع عليها الحشرات . This is really a great movement by the creator.i really love to read this post, and this is happen only for YANDEX CUSTOMER SERVICE, so i congratulate them to make it possible. لو كان لديك أى مؤشر يؤكد وجود النمل الأبيض في منزلك، فمن الأجود الاتصال مع ماهر ومتمرس مختص في مكافحة الحشرات مباشرة. أما إذا كنت تريد القيام بالمهمة بنفسك فيجب أن تدرك أن التداول مع النمل الأبيض يفتقر إلى خبرة ومهارة كافية حتى تبلغ إلى الأماكن التي تختبئ فيها الحشرة وتتعرف على نوع النمل الأبيض المتواجد أمامك والأهم من هذا إختيار إسلوب الدواء الموائم للقضاء عليه. يظن القلة أن إستخدام المبيدات الكيميائية قد يعاون في قتل النمل الأبيض تعويضًا من صرف الثروات لشركات المكافحة، حسنًا؛ إلا أن هذه السلع قد لا تناسب الحشرة المتواجدة في منزلك والأسوأ من هذا أن أكثرية السلع تتضمن على مواد سامة تؤثر على نحو سلبي على حياة الأطفال وذلك قد يعرضك إلى المزيد من الأضرار وأنت في غنى عنها.